Cobblestone Springs is a popular neighborhood in Avon, located just north of Rockville Road off of Dan Jones. This beautiful single story home offers three bedrooms, an office, formal dining room and split master bedroom floor plan. Great Master bedroom is very spacious with his and her closets, double vanities, jacuzzi tub and separate shower. A real retreat! 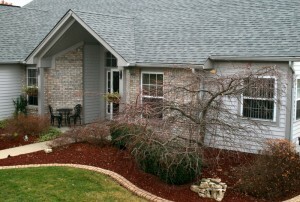 The large covered patio and deck overlooking the pond provides privacy, as well as a beautiful view from the back. SOLD in 10 days!